The Style 300 range of safety helmets offer impact protection against a wide range of falling hazards. Stability on the head, long duration comfort and ease of connecting additional face and hearing protection are the hallmarks of all Scott Safety's helmet designs. The Style 300 features an especially lightweight HDPE shell, choice of headgear with standard or ratchet adjustment and a modern, stylish appearance that promotes a positive company image. As a manufacturer, it is almost impossible to predict exactly what effect these combinations will have on a helmet's 'safe to use age'. Users must regularly inspect and maintain their safety helmet and have an appreciation of their work environment when determining when to replace their safety helmet. Sabre Safety recommends a maximum in use lifetime of 5 years from the date of first use. Providing the storage conditions stated in our user instructions are adhered to Sabre Safety recommends that our helmets have a storage life of 5 years in addition to their service life without any noteable decline in their mechanical performance. A safety helmet protects arguably the most important organ in a human's body and is relatively inexpensive to replace, if pre-use inspection gives rise to any doubt discard and replace immediately. N.B. Due to the nature of the high visibility colour pigments used in the manufacturing process, high visibility helmet variants have a shorter life-span than our standard colour safety helmets. We recommend these colour helmets are used for no longer than 12 months from the date of first use. Style 300 has been designed to meet the requirements of EN397 for shock absorption, resistance to penetration, ignition by flame and electrical insulation and is suitable for use in a wide range of industrial applications that require the use of head protection. Helmets should be inspected prior to each use for signs of deterioration or damage, with defective parts replaced immediately. Helmets with damaged shells, e.g; with cracks, dents, excessive abrasion or severe discolouration must be discarded. Regular cleaning using warm water and mild detergent is likely to help extend the helmet's lifetime. A brush can be used to remove stubborn marks and dirt from the shell. Prior to washing, the harness should be removed from the shell to facilitate cleaning. The use of solvents, hot water, or harsh abrasives is not recommended. HDPE belongs to polymers recycling category 7. Please see local authority regulations for disposal advice and locations. Adhesive labels can attack the structure of all plastic materials over time. Where labelling is a genuine necessity, Scott Safety recommends the use of acrylic or water based adhesives only. No solvent based labels or marker pens should be applied. Style 300 and Style 600 safety helmets can be specified as well balanced Forestry Helmet combinations. These combinations include in the same box hearing protection, visor carrier, mesh visor and protective neck cape. 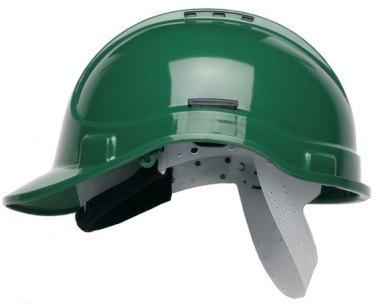 Both safety helmets are vented as standard and are comfortable to wear for full shift work. All combinations feature a Steel mesh visor, which offers the perfect balance of light transmittance and impact protection and a Zone 1 level noise attenuation performance, which covers 100% of chainsaws dBA outputs given a chainsaw would never run at full throttle for 8 hours a day. Suitable for Forestry, Arborist, Agricultural or Amenity work. FH/300	2029467	Style 300 Forestry Helmet Combination (Includes - HC300VELO Helmet, Z1FHME (Orange) Ear Defenders, KF010F Flexible peak visor carrier for excellent peak fit, IV930ST Steel Mesh Visor, HXCAPE - Orange neck cape) - Retail style combi box. FH/300/IC	2029469	Style 300 peaked Forestry Helmet Combination (Includes - HC300VELO Helmet, Z1FHME (Orange) Ear Defenders, IC920PZ peaked visor carrier for excellent peak fit, IV930ST Steel Mesh Visor, HXCAPE - Orange neck cape) - Non retail style packaging.